It is great at this time of the year, everything seems to be sending out new offsets or splitting. So it great that even the larger plants are at it. One of the yuccas that seems to be getting more popular in the UK, is yucca aloifolia purpurea. 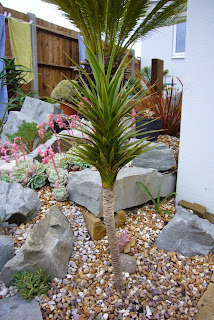 The opinion on hardiness seems to vary, so far it has not done too badly and has settled into the succulent rockery. Seems to hold its colour well, although will turn green if kept in the shade for any period of time. Back in March I noticed an offset poking it's head above the gravel. It has grown at a good rate and been joined by a second in the last couple of weeks. The oldest now has a few leaves and is starting to develop the distinctive purple colour, the new one is just getting going. If it carries on like this, it's gong to be a pest like the normal form. Can't be digging up the offsets all the time. The only cordyline currently in the garden is the more unusual cordyline karo kiri. Another of the test plants. The last one didn't do well in a pot over winter, this one in the ground was fine for this mild winter. Please forgive the photo which makes it look like the cycad is growing out the top. 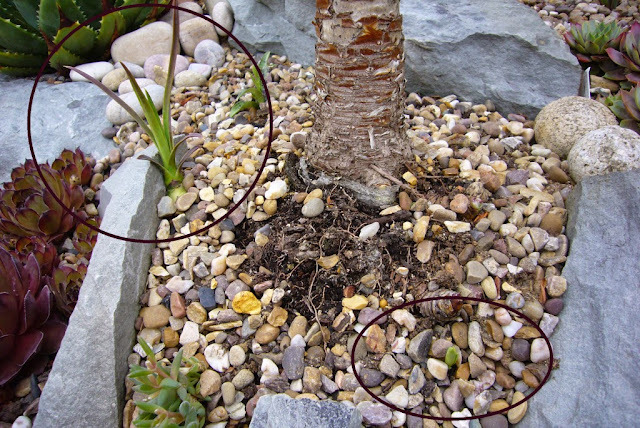 Photos on the internet show it as a clustering plant and someone in the UK has one which was damaged and sent out side shoots. 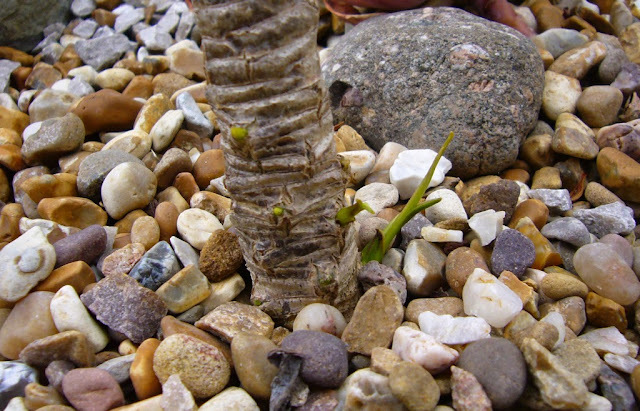 In fact when the original plant died, it sent out a few new shoots from the base. 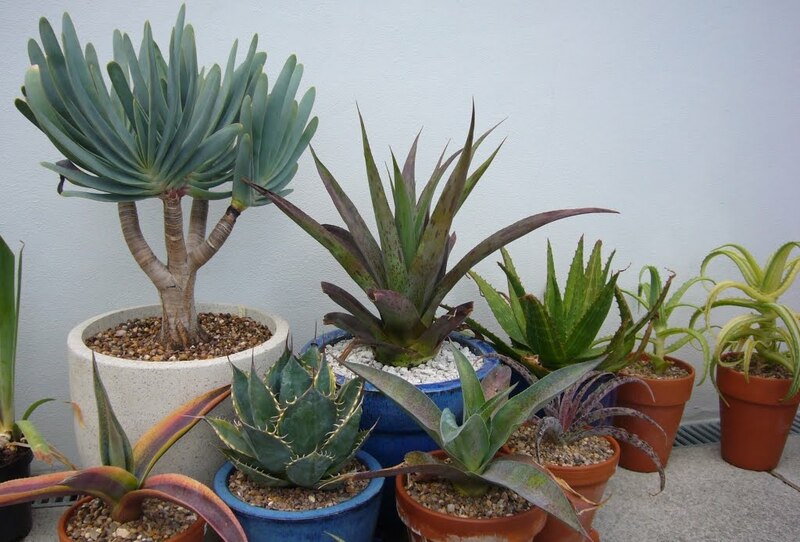 In the Uk you usually see them as solitary plants. It needs to offset as with on one stem it's starting to look a little leggy, and in this garden that only ends one way: with the plant being cut up. So was please to see that there are a few offsets / new shots forming form the base. Lots of new shoots there to give a nice bushy plant. I am going to have to make sure I water and feed it over the first part of the summer to get some good growth, then consider what to do come winter. All these new babies in the garden, it should be a much fuller rockery by the end of the summer. If it every stops raining that is. 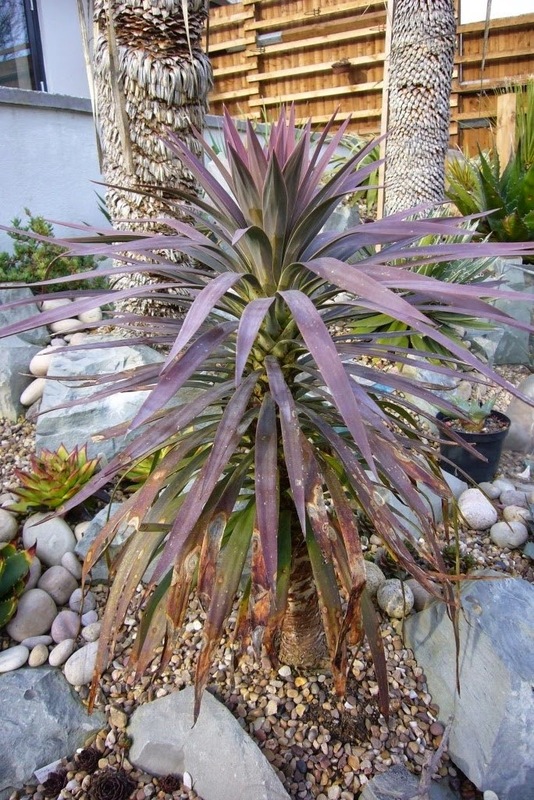 How is this Yucca aloifolia 'Purpurea' doing now ? I,m very interested to know as I have just bought one . Has it made a nice big clump /group of them ? Is it the hot sun which makes this colour up with that purple tinge or the cold ?